GLITCh – A ludum dare 36 post mortem. It’s time for a new post-mortem! Today I’ll talk about the game I made for the Ludum Dare 36, G.L.I.T.Ch. Yes, it’s an acronym and stands for “Game that Learns Information Technology to Children”. I must be honest, I got the gameplay idea long before the LD, mostly when I saw the Cubetto project on kickstarter. I told myself “Cubetto is fun in the base concept, but you could extend it a lot more if your robot was virtual”. I left this project/idea on a sheet of paper, extending with new features for weeks. I even talked about it on a forum like four months ago ( in french ). The ludum dare was the opportunity to materialize the concept in a proof of concept. For the theme, I immediately thought about Wall-E, an old robot forsaken on earth (that’s your ancient technology) but the only one “alive” as other, more advanced robots suffered from a glitch. As the player, you would have to program your robot by placing instructions on the level. In it’s core concept, the game is reminiscent from the old Amiga game “Brat” ( gameplay video ). Due to the heat at this end of the month, I woke up at 5 am. As I live in France, the LD theme is announced at 4 am, so it was almost a perfect match. I just checked the theme of the LD and got back to sleep. At 8 am, I fired up my IDE with MonoGame, a open-source XNA replacement, and with my MonoGame extension libs. Having done mostly platformers with the previous ludum dare, I knew that my lib didn’t have such features as controls (in the Windows sense); I would have to implement draggable items, buttons, control panels, and so on. Also, my lib supports sprite animation but it is very experimental, and I never tested it in a game (only functional and unit testing where done in a previous project, but I didn’t know if the framework put in place to handle the animations was easy to use or not). I basically started by copy / pasting the initialization code from the LD35, and replaced menu and title images from the previous game with new images. I choose to use pixel-art (upscaled 4 times, that means that each sprite pixels use 16 pixels on screen) because it’s an art style that I’m at ease with, but also because it’s fast to produce. The day was taken mostly to add basic features and to test the core concept, aka “put arrows in place, make the robot follow the arrows to the exit”. Around midnight, I had my first level working, but very rough controls and input (mostly due to bugs in the draggable code). I had to get back my daughter who was on holidays for a week with my girlfriend’s parents. I only had the time to code/draw late at night (starting from 9 pm to 12pm). I already knew that I could not make it to the compo, and that I’ll have to use the Jam extended time period to finish my game. However, as the base was working, I could code new tile behaviors (the no command tile). I also had the idea of a switch that can control a distant gate, but my level editor ( which is a simple HTML page where you can drag and drop items on it, generating the XML for the level ) didn’t support editing of properties that aren’t positioning properties (i.e. top left width left and tile type). While for other games, I could dodge this missing feature by using tricks, I had to implement it for the LD 36, as I needed to tell the switch which gate it could open. I also had another problem; in the first design, I thought I could make the robot “fall” from the level if an arrow was misplaced; however this proved difficult to implement as you may run in drawing order changes ( currently, the level is splitted in layers, a bit like photoshop: the background with the tiles, the one where the commands are added, and then the layer containing the robot ). This layering system is a legacy from the previous ludum dare ( it’s nice for a platformer, as you can put items behind or before the player sprite ) but is not so clever for a top down game. So, when falling, my robot should have been occluded by tiles that are at the same ground, but lower from a screen perspective. Due to the false 3D perspective, I would have to encode some kind of Z component on each tile to tell if the robot was occluded by the tile when falling. That was really too complicated, especially due to the time frame left. It was simplier to stop the robot in a fail-safe mode (OK, it is ancient technology, but even the Roomba has sensors to prevent to fall from stairs :D) and indicate the player that he was stuck. And that was doing the trick! Again, as I was working, I did know that I only would have 3 or 4 hours more to work on the game on Monday. I usually spend Mondays on polishing the game: adding transitions, tests, timers, fading screens and so on. Usually, the game without these things shows a gameplay concept, but taking time to adding non critical things like this gives your game a polished look. I prefer, in general, have less features but a well finished game than putting a lot of untested / badly tested features in a game. And most of the time, some last added features proves to be bad features. Keep It Simple and Stupid (KISS) principle prevails in all of my games :D.
The robot animations (move left and right were made, but I also wanted to include rotations and move up / down animations). Drawing the robot rotation in pixel-art proved to be a real challenge. This game was made essentially to teach the basics of computer science to my daughter; It was time for her to test the game. After explaining her the base concepts of the game, she was able to play through level 1 to 4, but the fifth level proved to be a bit difficult for her, and I had to accompany her and explain her some tricks to finish the level. As I said, this year was the first time that I decided to participate in the compo. 48 hours: a game, with all the code, art and music by myself and donated to the public. Yesterday, the voting period ended, and I admit that I was expecting a much lower score on the criteria that interested me. Despite bugs and problems in the early days of the compo, the worst days for that to happen, the game had a relatively good reception. 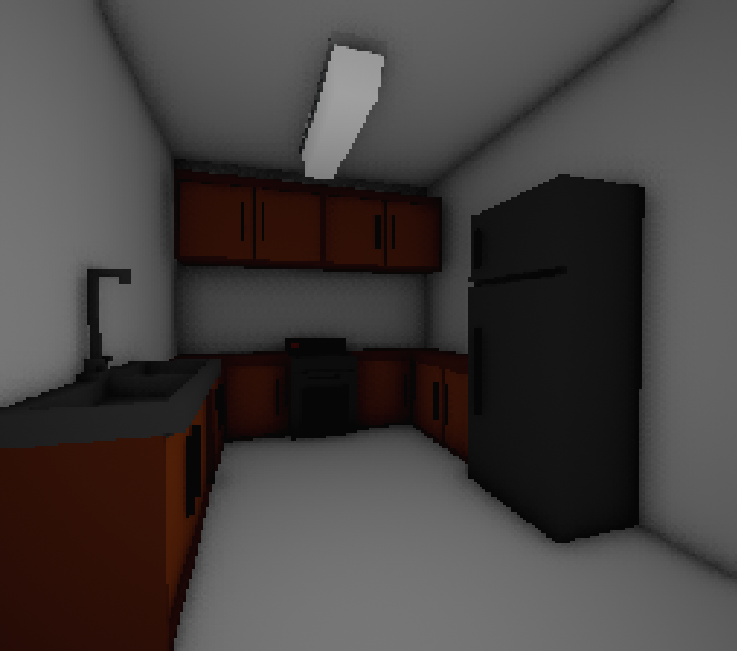 I learned that gritty atmosphere can even be attained with a naïve aesthetic seen in voxels without generating a negative reaction; nonlinear writing however confused several users, but many got by far uncomfortable sensations, which it was my goal; The proof of concept where the player is a psychopath, but without clarifying who is truly the monster or victim, was extremely well received and many believe that I should expand the concept to a full game; something that interests me the most. The main reason to the average score is mainly the story was lost; which I owe to the lack of more time to be polish it, it just wasn’t well delivered. My mistake was to deepen the unessential story. Many pondered the visual style and the work of shaders. Especially the technical work; as in the case, I used a single texture that was a RGB palette rendered into tiny PNG. The shader used to divide the screen into a pixelated grid; was also highly welcomed. As well the use of chromatic aberration and noise, to emulate a feeling of loss of sense of reality was highly appreciated. Several mentioned that the artistic aspect was lost mostly to the shader pixelating the game world. An error on my part was too not adding more variety in vegetation for the courtyard. I’m a terrible musician, but I have less musical talent than a fish. I admit it’s not my forte, and I expected that low score. However, most criticism was the lack of variety in the music, which I will consider for the next competition. My mistake was also unable to provide sound effects, but I did not have time to create sounds like crying or injuries of the victim. The main reason for the low score is the same as I expected, given the clone of the game of cat and mouse that I implemented. Although I wanted to do a much more complex game of stealth, with executions and elements alike, creating the AI ​​for the game, consumed me a good couple of hours I could not use for anything else. However, many admitted that expanding the concept to more elements of gameplay would be welcoming, something that attracts me to do if I expand this concept to a big game. With all the aforementioned elements, the graphics and gameplay limited factor, affecting a higher score. Things to keep in mind the next time. The good thing is that this AI can be used in any other project, which will give me another occasion greater creative freedom and attention to the gameplay. The game at no time sought to be hilarious and fun. On the contrary, looking for something to bother and generate similar experiences. You’re a murderer at the end of the day, without precisely defined emotions, the mood was reached, and my objective accomplished. The fun score, shows me clearly that the elements of cat and mouse, are already very common for this kind of games, and that the opportunity for the victim to defend itself undoubtedly was tempting and would have scored me several more points, but time was lacking. My entry for the 48 hour compo Ludum Dare was Pedestrian Slaughterer, a game where you shall do your very best to slaughter as many pedestrians as you can because you’re a monster, however if you run out of bloodlust you lose! To your advantage you have a hovercraft to more easily slaughter more pedestrians quickly, however be aware if you hit something to hard you will fall off and lose! 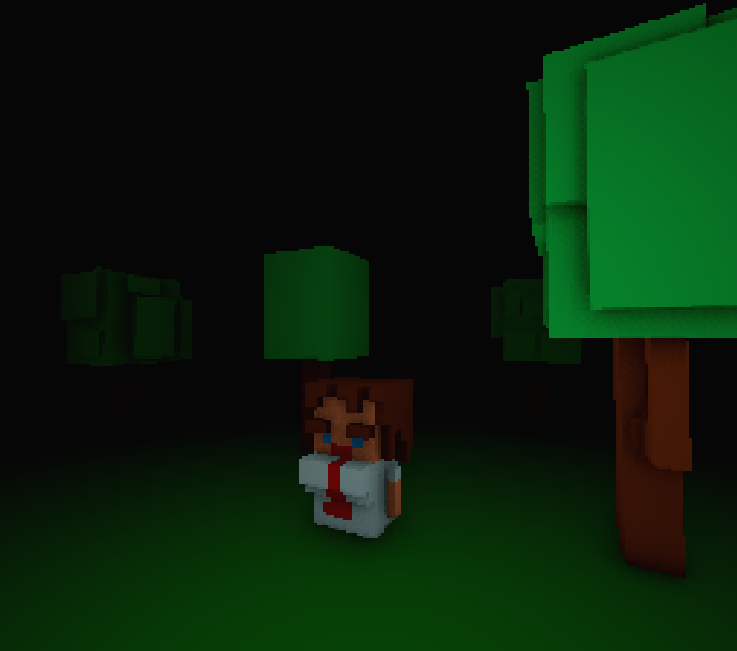 Graphics: I am actually quite happy about the 3D models of my game. I really enjoyed working in blender, however I don’t have much experience with it and this was my very first 3D game that I actually completed. Which I am very happy about. The outline effect gave a cartoon-ish look, which I find very cool. Using db4free.net: I had a suggestion to add a score board in my first game and I used that advice, luckily I have used this free database service before and it is really easy to setup, it is not very reliable but for something like Ludum Dare I don’t really care about consistency or security (let’s be honest, who’d actually care about creating a dedicated server for a small game like this?). Ragdolls: I successfully added ragdolls to my game which is awesome, I mean they are probably the best thing ever. The idea: The theme was probably the best one so far for me and I am really happy with the idea I came up with. I love ragdolls and I wanted to do a 3D game for a change instead of “another one of those 2D platformers”. Sound effects: I had very little time left for music and SFX, so I just ended up doing some random sounds with my voice and audacity which I find added a lot to the style of the game. Time Management: As usual I am not very good at prioritizing fundamental game components from small details making it hard to throw in everything I want to make a “decent” game. I’d like to get better at it, but I guess practice is one of the best ways. Lose and win conditions: Originally I planned to just let the player try to kill as many pedestrians as they could and the only way to loose would be to crash into some house or mountain but I figured it could easily be exploited and people could just go really slow and practically avoid losing whatsoever. Control issues: I had some complains from my friends that the hovercraft was hard to control, and the only excuse I have is that I didn’t have time to do any play testing really. I really wanted to implement drifting so that you could “drift” around houses and have much better control. Thanks for reading my post and have a lovely day because you are awesome! For LD32 I knew I wanted to tackle the ultimate Classic Ludum Dare game: The 2d pixel art platformer with a cute and hopefully distinctive mechanic inspired by the theme. My aim, this time, was to try to improve on my ‘fun’ score and if that’s what the final verdict is I will be so happy. There was no need to kill this robot. The result was Mass-X, where the mechanic is being able to switch positions with robots. I didn’t include any puzzle elements – I wanted it to be all about trying to find creative ways to kill as many robots, as possible or get through levels as fast as possible, or basically just bounce around for fun. Day one was murder. I wanted to have the basic mechanics of the game coded by lunch. It actually took me the entire day. My custom engine itself didn’t have all the features I needed, was full of bugs (probably still is!) and the collision detection stuff was a total shambles, so it was all incredibly slow and difficult. … and I wanted to give the whole thing up and die. 3 months of preparation for this rubbish? It was actually about 6pm (6 hours before the deadline, my time) by the time I’d recorded the music and sound effects and done all the tile art for the sprites (and got the animations into the game) and was finally ready to begin designing levels… at which point I started discovering even more bugs with the collision detection and found out that my level editing tool was completely broken. I had to constantly save, export then restart the software every time I need to create a new level or make a change to a level. Nightmare. The result is that the game is far shorter than I intended. Far, far, far shorter. I really wanted to prove that my tools were good enough to make a lot of content quickly and I have learnt that, in fact, no. They’re not. Not even close. Final “What went badly” was the fact that I completely forgot that this was a browser game and I completely screwed up the mouse controls. If the cursor goes outside of the browser window, your cursor freezes. There’s a bug in the cursor-to-world translation, too. Basically the controls are a mess which is fine until the last two levels, at which point many people find it impossible. Quick workaround is to reduce the width of your browser window, creating some buffer space at the bottom. I apparently developed the game like this which is why I didn’t find the problem until it was too late. Going Pixel Art was terrifying. Something about sharing stuff you’ve drawn… it’s so much more personal than 3d models. I feel like Mass-X is far more of me than any other game I’ve made. I stuck with 10×10 pixel tiles which worked out nicely. They’re a lot less work to draw than 16×16 (156 fewer pixels to colour in per tile!) but more expressive and detailed than 8×8. I know I have a long way to go with pixel art (MOAR DEPTH!!!) but I accidentally achieved a consistent style which I think works pretty well. Swanky Paint – it’s a quirky clone of Deluxe Paint 2 with one absolutely killer feature for me: It supports bloom. It meant that I could draw the art ‘bloomed’ then save them without. It meant that when rendered in game the art looked like it did in Swanky rather than all blown-out and too bright. Swanky Paint saved my bacon. Guitar Midi Synth – I have this thing on my guitar which makes it output midi, which meant I was able to compose music on an instrument I actually understand and can improvise with. I’m quite pleased with the music even if it’s pretty rough and filthy. The sound effects were also a huge amount of fun to make – lots of layered sounds from my own voice and synths, all put through fancy effects. I’m especially thrilled with the bumper sound and the swapping noise.. a dirty buzz and a whoosh and a bang. I also think the basic idea of the game works as well. I hope it’s fun for other people too. It has a lot of potential as a puzzle platformer but I kept it more action/adventure approach than I could have – I’ve seen some fantastic LD games with the same basic mechanic but done as a puzzle platformer instead. It turns out this particular mechanic has a lot more potential than I realised. The engine is a little trooper as well. It turns tilemaps into single meshes which are incredibly quick for GPUs to draw. The post-processing effects are a bit of a trial for really bad GPUs, but you can get 60fps on an Intel HD 3000 as long as you don’t try to run it in 1080p. Finally… deploying. This time I was able to deploy for HTML5 and for Windows, OSX and Linux (32 bit) with a single command. I’d done a lot of work preparing this side of things and it really paid off. Assuming I want to make another 2d pixel art platformer I’m going to want to fix my level editor’s bugs, add more features to make drawing levels quicker – cut and paste would help. I also need some sort of game boilerplate that means i can start by writing object logic rather than having to set up switching between titles and levels and all that. My personal challenge for next time? I want to see what the verdict on Mass-X is first. Then I’ll know what I need to focus on next. Fun is, I think, the most important category. It’s the truest test of a would-be game designer’s skill, I think. Thank you for reading and for playing Mass-X. It’s a short, broken little game but I think I actually love this one. Ludum Dare 32 or the story of how I inadvertently completely ignored the theme. The first day of the jam was spent entirely on looking at visual references. The second was spent on making those visuals. The third was spent on making the story. This is the hardest I’ve ever worked on a game jam — and the game is maybe five minutes long. God’s Gonna Cut Em Down (GGCED) is my first foray into the visual novel, using an engine called Tyranobuilder. All of the art is done by me, through an over reliance on the Photoshop Blur tools. The game is a short vignette — think of it as the first chapter of a larger work. It is, in essence, that. After working all weekend on the art and design for this game, I’m looking towards continuing to work on it. Play the game here – comments and ratings appreciated! This was a firstie in many ways. It was my first ludum dare, my first game jam, my first finished game, and the first game I ever created without the intention to recreate/immitate an existing game mechanic. About a year ago, I would never have expected to even participate in a game jam like Ludum Dare anytime soon, and here I am with a (more or less) finished entry. The original idea was to create two worlds, nature and human civilization, coexisting in a subtle balance that could be disturbed by gathering too much natural resources (trees/plants/animals) and other things. I planned to do this visually as well but that turned out to be pretty time consuming, and knowing the mechanics I wanted to implement, I decided to finish these instead. I also wanted to add disasters but I couldn’t add them for the lack of time. The game’s design was inspired by dwarf fortress. It also has been quite a learning experience. I’ve learned some lessons in AI creation making the commands for the workers. A lot of fun I had making these small sprites (I really loved doing them) and got in touch with a new approach and method to make games. I’ve worked with alot of static variables to design the map and map objects and applied some of my knowledge in memory effective 2D rendering. It was an interesting jam to say the least. I am looking forward to play all other Ludum Dare entries to check out what others have made during 48 hours. And of course, this will not be the last time I participate in a game jam too! Well this was my first LD so they were basically null. Haha. Seriously, I didn’t even think I would finish a playable prototype. My original goal was just to try and finish something, other than that, no real goal as far as rankings go. I’m not going to lie, I made some rookie mistakes. Well first of all, I have the advantage that the compo started at 1 P.M for me, so that was a nice time in the middle of the day for me. The rookie mistake was that I was incredibly hung over. Haha. The largest problem I ran into, and what some people picked up on in the feedback, is that I had no way to produce sound. So in the end due to time constraints and the lack of software, I opted out of adding sounds. Seriously, I was absolutely blown away by all the nice comments about how funny it is etc. I didn’t expect anything like it. Next LD (Which I am 100% participating in.) I need to add sounds. That is my number one goal. I would also like to figure out how to do animations. I feel like they add a lot of polish to a game. Thank you everyone who played my game and to the entire LD community to being incredibly nice and helpful through the entire process! Bring on the next one! Woo! Now, a message from Yogo bear! It is an asymmetrical 2 player (one with a mouse and keyboard, the other with an Xbox 360 gamepad) 3D fire sim toy thing. You only get one match’s life (if you’re player 1). Water and fire interact in the usual way. Strike the match on the rough rock to start. Points are awarded for tree/ house voxels burnt to the ground. There’s no sound. This was my second ever game jam and I learned lots from this project – obviously fire simulation, but also the particulars of Unity’s particle systems and I’m sure lots of other things I can’t remember now. I started lots of things that didn’t go into the final game – independent voxel fire grids that could interact, procedural generation of terrain. I guess the maths was a bit too difficult after nearly 28 hours of programming for my brain! I really shouldn’t have eaten so much sugar. Maybe next game jam I’ll remember! 1. make agreements with the team, believe on me : personal events during the ludum dare can ruin your tighty schedule, so before start make sure everybody involved is in the same pace, and with the calendar free. 2. practice the basics of the technology some days before, even knowing Unity3D, as it’s not my daily basis tool some basic activities took more than expected. 3. react fast, as we had some changes in the people involved in the project, instead of creating useless code while waiting for the artist, I should change the game plan and go with something that could be done with my own artistic resources. 5. define as a team what will be the folder names for the game assets in unity, so when the export package all over the place madness start, you don’t loose precious time reorganizing files, materials all over the project. 6. don’t make reusable code for ludumdare make straight forward code, and then after the ludum dare, find some time to refactor and reuse wherever you like. 25 queries executed in 0.136 seconds.